Gwendolyn Farmer has enjoyed watching lots of children grow and succeed during their years at Ida Barbour. Mrs. Farmer is very experienced in her field and an important asset to Ida Barbour. 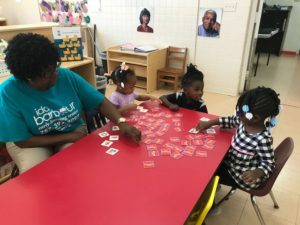 Ida Barbour Early Learning Center is a close, relatively small community with ability to grow. Ibelc will go far. In the current setting there is a focus on community. The children know each other and the staff. Life long bonds can be formed – a second family, a safe place. With newest approaches like interactive learning, which Mrs. Farmer pointed out, the facility definitely is up-to-date and competitive. Interactive learning is hands-on training involving all senses, hearing, seeing, doing…. Plainly memorizing information is outdated and likely to be boring for the student. With interactive learning, the student is in the spotlight, not the teacher, who supports, guides and motivates instead of lecturing and preaching about even simple daily tasks, like handwashing and tying shoes. Ida Barbour encourages Imagination, critical thinking and problem-solving skills. Mrs. Farmer herself is a 60-year resident of Portsmouth where most of her students also grow up. She knows the area and sure knows where to go and what to do here. This is beneficial for students and their families who she’s able to be on hand with help and advice in many aspects of their lives. Mrs. Farmer feels she is in the right spot for work and so does her team! Thank you Mrs. Farmer for your dedication and loyalty at Ibelc! We Still Have Room for Your Summer Campers! School’s over, summer just started with a long way to go! We know students and parents are ready for a break. So what will your school-aged kids do this summer? We still have spots open in our Summer Camp at Ida Barbour for our curious fellas, hungry for knowledge, loving life. No time to be sad, no reason for it with this phenomenal line-up our teachers put together for this year’s participants. 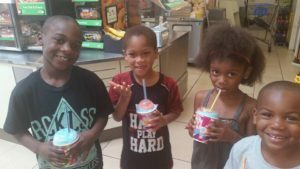 Highlights like the Children’s Museum, Bubbles the Clown, Jonathan the Juggler, trips to the Portsmouth Police and Fire Department, Mr. Tim’s Ice cream truck, Cinemark Movies 10, Portsmouth Splash Park, Norfolk Zoo, City Park and the Portsmouth Public Library make our camps so amazing. Who would be bored with this variety of entertainment? All those exciting features are well worth the small registration and summer activity fee to cover the cost of in-house and off-site field trips. I want to encourage you to not miss that chance and allow your kids an unforgettable summer filled with friends, fun, excitement and adventure. Being ready for school contributes greatly to a child’s ability to succeed academically and socially, in school and in later life. It requires physical and emotional well-being, motor development, a positive approach to new experiences, social and language skills, cognitive skills and knowledge in general. A child’s readiness for school is impacted by many things, including home life, health, and their social environment. So many people view child care just as a babysitting solution for kids whose parents work. But it is SO much more than that. It is important for children to be around other children to start developing normal social skills. Kids thrive in child care centers, being surrounded by activity, other children, and people of all ages. Teaching kids the coping skills of dealing with new environments and people is important long before kindergarten. Appropriate ways to behave around others is more easily grasped, and with the guidance and supervision of caregivers and educators in a professional environment, problems of many kinds (social, physical, emotional, health related, etc.) can be noted and resolved early. It’s interesting how children learn from each other, not just from adults. Speech moves along more quickly, (potty training, too!) and there is a great improvement in confidence. Routine and structure are important to learning. 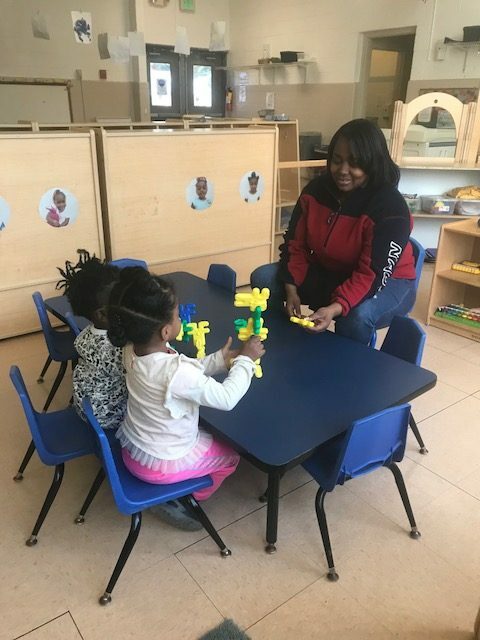 In a child care center like Ida Barbour, it is more likely your child will have an educationally enriched curriculum that encourages literacy, language development, social and emotional development, as well as age appropriate learning of math, science, and other disciplines. Have you ever received a frantic call from a relative or other caregiver that they can’t take your child the next morning? Parents who work are either left at the last minute with what to tell their boss if they cannot be at work when they need to stay home. In a child care center, should a teacher become ill, there is always a substitute who will fill in who already knows your child. There are advantages to staying home with your child. Every child is different and every family has a different situation. At some point, however, we highly recommend having children in a structured learning environment before they go to kindergarten. The mission of the Ida Barbour Early Learning Center is to prepare each child for success in school, community, and life. 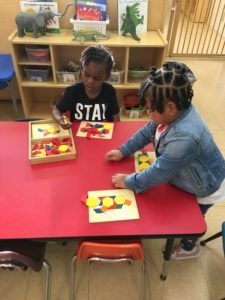 The Ida Barbour Early Learning Center enhances the life chances for all children and their families by providing care in a safe, nurturing, and highly enriching environment. Ida Barbour’s Lead Teacher loves what she does, especially at the Center! 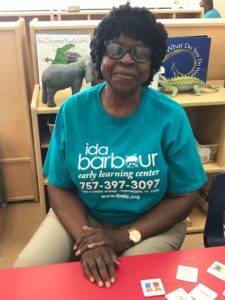 She is in her third year at Ida Barbour, after running her own day care at home. 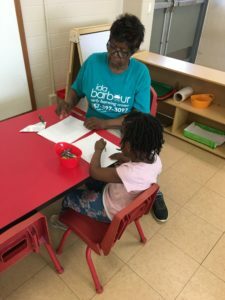 Born and raised in Portsmouth, a graduate of Woodrow Wilson, Lakeshia has enjoyed the larger space, equipment and extra assistance Ida Barbour has over trying to teach and care for children in a home environment. She also realizes that you don’t often get to know everybody and grow professionally in a large corporate type chain or franchise offering childcare. When asked what she feels is her best results when teaching, Lakeshia will tell you the learning process for colors and shapes, two of many important aspects of early childhood curriculum. Lakeshia especially likes to teach Ida Barbour’s two-year-old children as they are eager to learn and take in everything you say. Lakeshia stresses that the priority for Ida Barbour is to gain more space so that both teachers and the children can focus directly on the activities of the day and listening easier to each other. She is excited about the architectural design for the new Ida Barbour. Please be sure to check out the design and information about our Ida Barbour Building Campaign. We need your help, both in donations and being an ambassador for us to share our news!